Attending: about 30 residents. Including Rep. Paul Workman and ESD #6 Chief Robert Abbott. 2. Mid-Long term plan for RM620: contracted planner to determine final alignment (e.g. w/ express lanes) – enables funding. TXDOT is planning four concrete barriers to be added on curves along RM620. 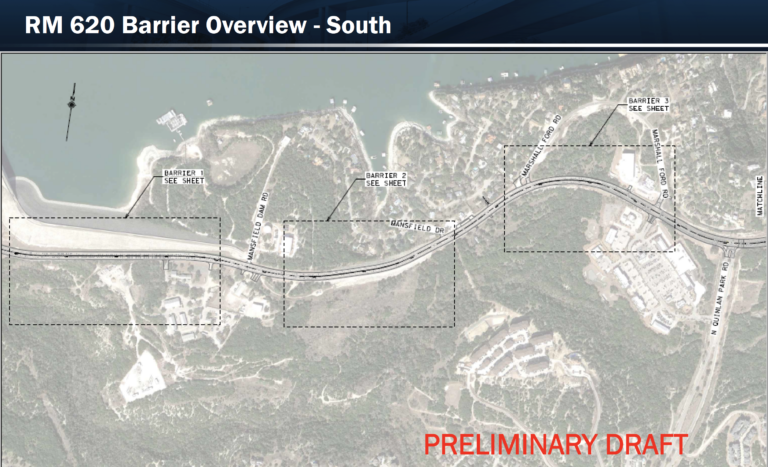 See pages 9-19 of TXDOT presentation. These will be median barriers that prevent crossings by out of control vehicles, similar to those used on Mansfield Dam presently. There will be three barriers south of Quinlan Park Rd. Locations are approximate as TXDOT is still evaluating the details. TXDOT has contracted with Brown and Gay Engineering to develop an implementation plan including the ultimate alignment, number of lanes and where and when they will be at ground level vs. elevated. This implementation study is the next step after the feasibility study TXDOT completed in 2016. The feasibility study concluded that at least 10 lanes will be needed total in this stretch of RM620; e.g. six regular and four express lanes is one possibility. The ultimate build out is also anticipated to include fly-over ramps from RM620 to RM2222 – those may pass over River Place Blvd. also. The study planning will begin September 2018 and is planned to complete in approximately December 2019. After the study is complete the next step will be funding of the build out followed by construction. TXDOT did not offer an immediate timeline for the ultimate build out. SRNA Chairman Brian Thompto highlighted that the build out timeline may ultimately be a function of how well the RM620 corridor engages to ensure political support from local sponsors such as the Cities of Austin and Cedar Park and both Travis and Williamson County together with CAMPO and state money. The following image is from the TXDOT RM620 feasibility study and showed one possible alignment where RM2222 is connected to RM620 by fly-over. and where traffic heading north bound on RM620 can enter the elevated lanes before RM2222 by-passing the intersection. This drawing is conceptual and does not reflected a planned alignment. 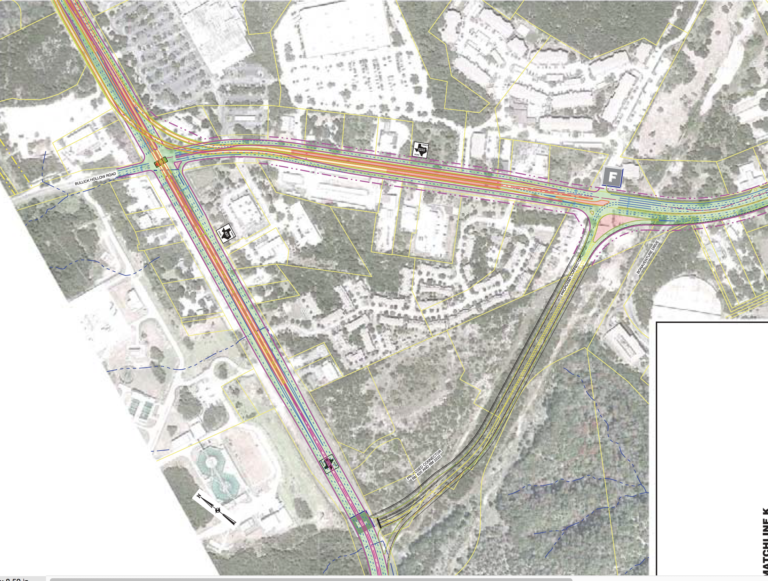 The implementation study will be used to identify the final alignment including where ramps and elevated sections will occur and how they will interface with the existing roadways. 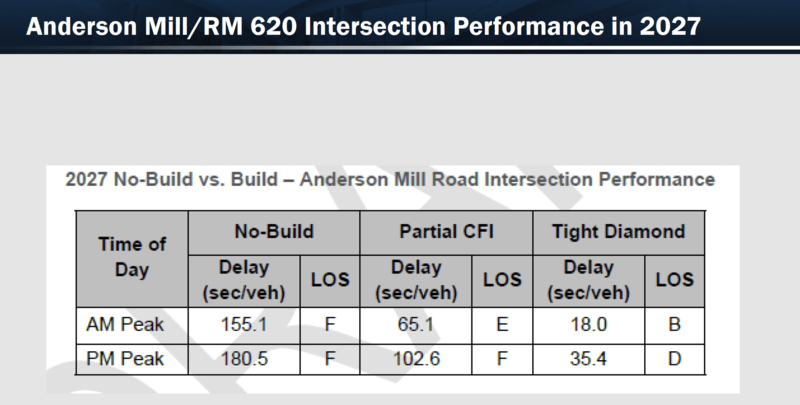 TXDOT has studied options for Anderson Mill Rd. @ RM620 improvements. Anderson Mill Rd. is the next most congested intersection after RM2222. 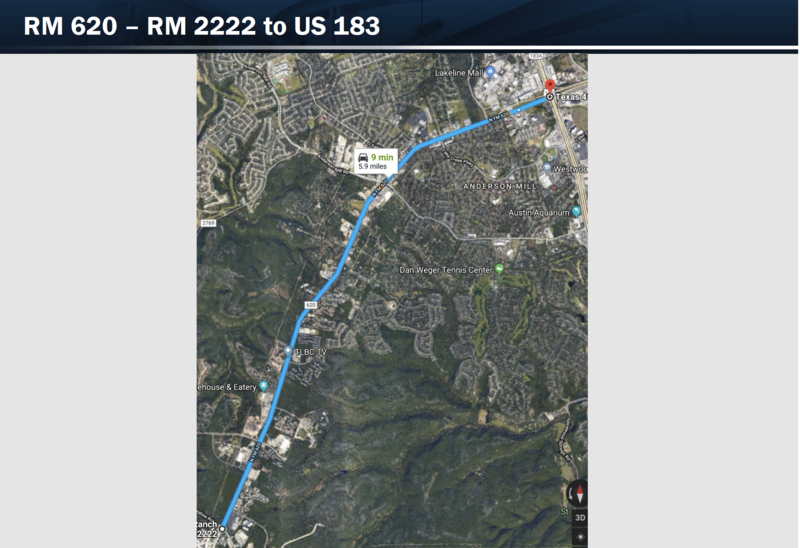 TXDOT evaluated an “innovative intersection” show in the slides as page 24, but determined it would not be effective, see “Partial CFI” in image below. The result of the study was that an overpass would be required in order to provide sufficient traffic relief for a sustained period of time, see “Tight Diamond” in the image below. A conceptual example of a “Tight Diamond” intersection for RM620 / Anderson Mill Rd. 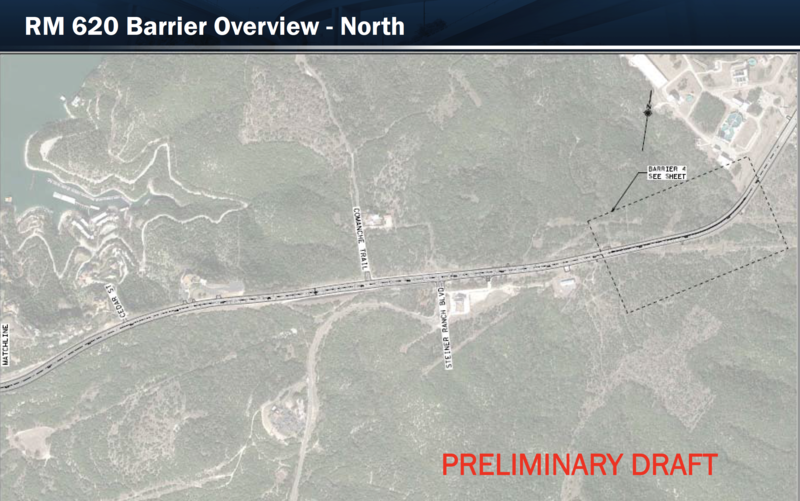 is shown below (Not a TXDOT image), in practice for RM620 / Anderson Mill Rd. 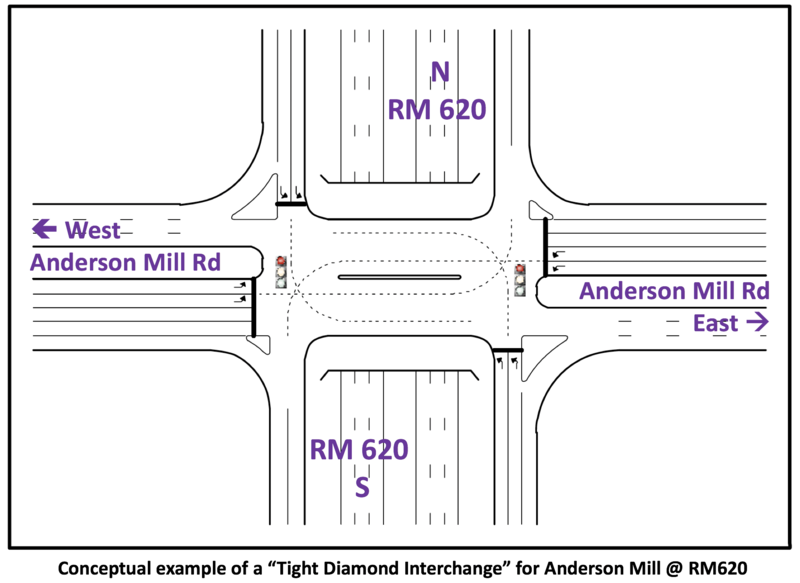 RM 620 may be the likely overpass, but this image gives some idea of how a “Tight Diamond” interchange works. Bruce Byron advised that the planned RM620 / RM2222 Improvements should be expected to be completed in 2020. He also advised that TXDOT has been looking at how to minimize disruption. During construction there will be at least one period of time where they will need to shut down one of the two left turn lanes on RM2222 West onto RM620 to put in a drainage pipe underground since drainage needs to occur down Bullick Hollow Rd on the West side of RM620. SRNA Chairman Brian Thompto ended the meeting by speaking to the progress made and steps ahead for RM620. He started by speaking to the importance of maintaining a strong public engagement from the community. 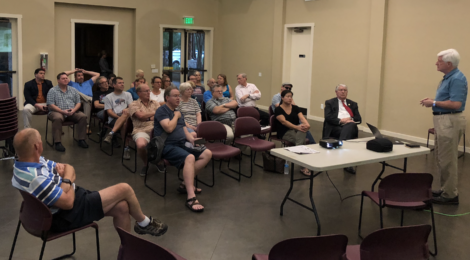 Earlier this year after a series of accidents, some fatal, on RM620, many citizens from Steiner Ranch, including Tom Henry and Morgan Briscoe who were present at the meeting, made their voices heard regarding the need for safety improvements. In response, it was very encouraging to see our government at work with the support of Commissioner Brigid Shea and Rep. Paul Workman, TXDOT has identified safety improvements to reduce fatal injuries quickly, with an aggressive timeline for implementation. He cautioned that while we anticipate improvement in traffic headed down RM2222 after the construction at RM620 and RM2222 by 2020, that those are only partial solutions to the RM620 congestion issues. The work that TXDOT has begun for completing an overpass at Anderson Mill Rd. and for the ultimate addition of additional lanes (express lanes, etc) on RM620 will be critical to resolving the massive congestion challenges on RM620. For that we need to keep our corridor engaged so that we can motivate support from local government. If you have contacts along RM620 please talk to them about getting involved, email chair@steinerranchna.org. Also, please use this time to support SRNA by signing up and supporting us.